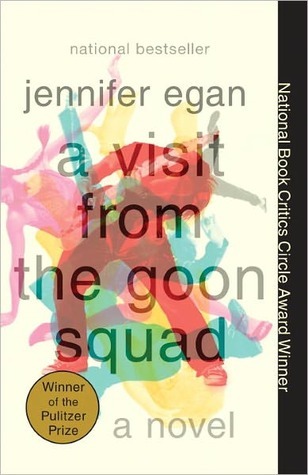 I just finished reading A Visit From The Goon Squad, by Jennifer Egan. Between the book having just won the Pulitzer Prize, and a recommendation from my brother Mark, I figured I’d check it out. I definitely enjoyed it. Egan’s storytelling technique, the very structure of the novel, was what I found most entertaining. Each chapter features a different character, and there isn’t a chronological progression from chapter to chapter. Each character is somehow related to another character, leading to an overlap from chapter to chapter… but only a small overlap, most of the time. With the shifting timeline as well, you never know where the flow of the writing is going to take you. There’s no past, present, or future if each chapter comes from a completely different perspective, despite the chapters bouncing around a timeline that spans over forty years. There are threads that tie everything together; in my head, I envision one of those criminal investigation bulletin boards showing all the ties for organized crime, like in The Wire. Music is another thread throughout the book, but don’t worry, you don’t have to be a music geek to enjoy it. This isn’t High Fidelity. Something you need to know if you’re going to read this book — don’t try to read it on a Kindle. One of the most unique chapters is presented as a PowerPoint slide deck, and the reviews of the book on Amazon say that it’s very hard to view the slides on the Kindle. I’m glad I picked up the paperback instead, since this wound up being one of my favorite chapters of the book. If only my presentations conveyed as much in slides as this chapter, I’d have a whole new line of work in front of me! I turned the screen for that chapter. It wasn’t so bad. I don’t own a Kindle so I read the book in paperback. Still when I came to the Power Point chapter, I googled and found the chapter in full color presented on my computer screen, with sound!